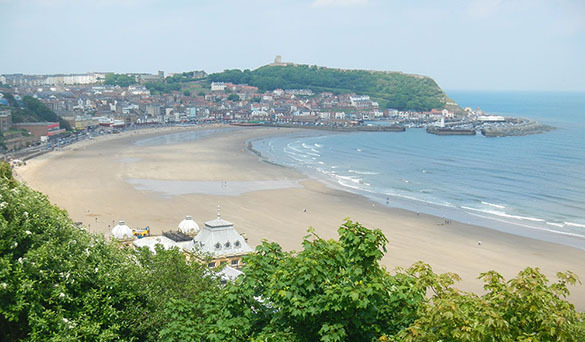 SCARBOROUGH, ENGLAND (June 5) — It was a spectacular day on the coast of northeastern England. When Paul Taylor arrived by train at 10:30 this morning, the clouds broke and the sunlight streamed through. 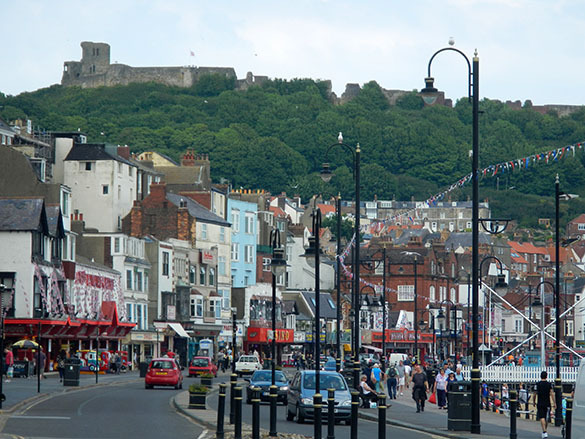 Mae and Meredith explored Scarborough in the morning, plotting out where the stores and other useful places are, and Paul and I began to sort through geological action plans. Peter Rawson, on the left with Paul Taylor, joined us for lunch to give us local field advice. 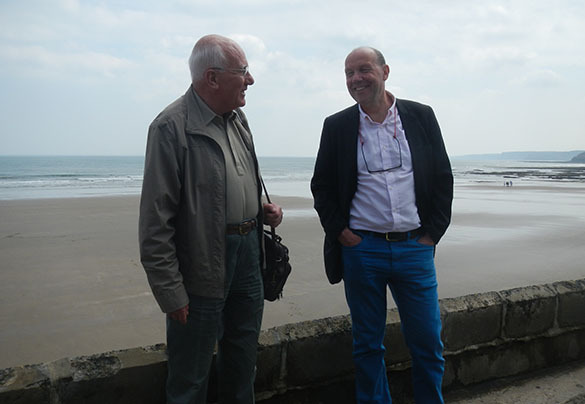 He is the senior author of the Geologists’ Association’s Guide to the Yorkshire Coast, so there was no one better to have as an advisor. We had lunch in one of the classic spa buildings and made our field plans for the next few days. 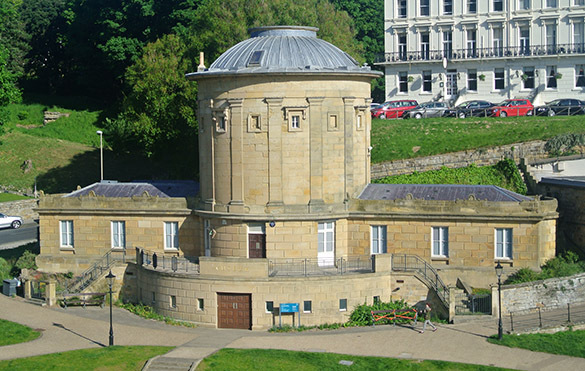 After lunch we visited the Rotunda Museum (above), which is devoted to the geology of the area. 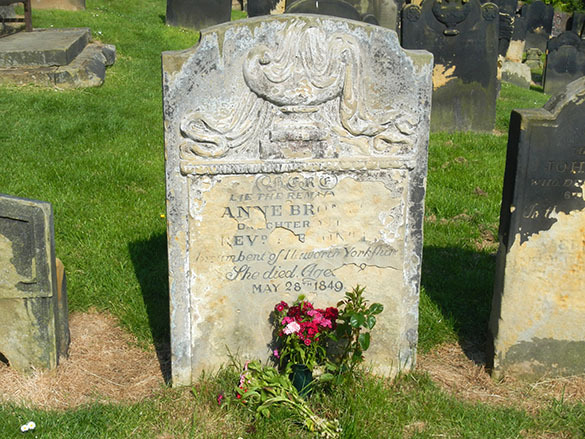 It was built in 1829 out of the Jurassic Hackness stone. William “Strata” Smith suggested the unusual design, and much of the museum is devoted to his accomplishments and legacy. 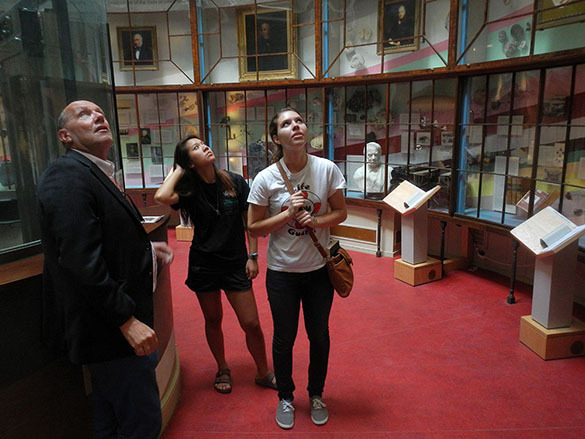 Paul, Mae and Meredith are examining the upper levels inside the circular Rotunda Museum. 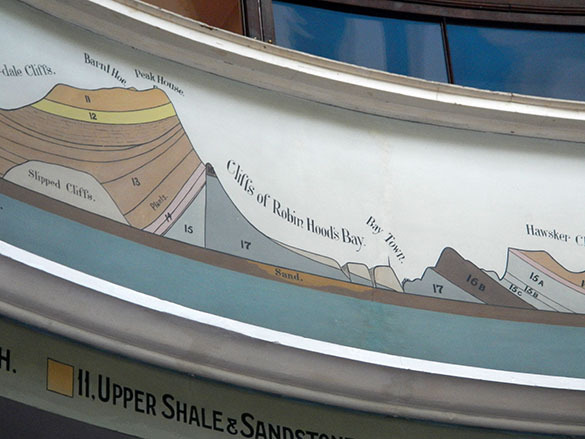 The motif around the rim of the main room in the Rotunda is the 19th Century version of the local stratigraphy, including some places we will be visiting tomorrow. 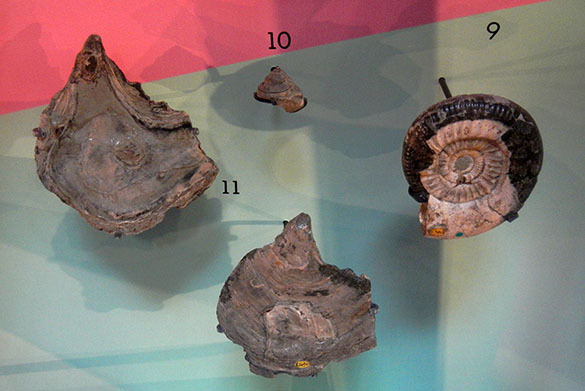 Many of William Smith’s original fossils (loaned by the Natural History Museum) are on display. 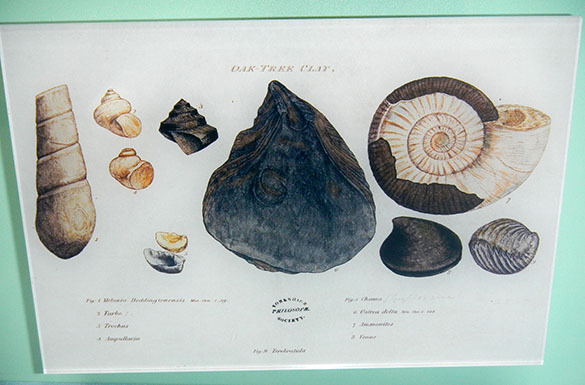 We could in several cases match the specimens with Smith’s illustrations of them. Afterwards we went down to the marina and inspected the crab and fish traps sitting on the wharves. What were we looking for? 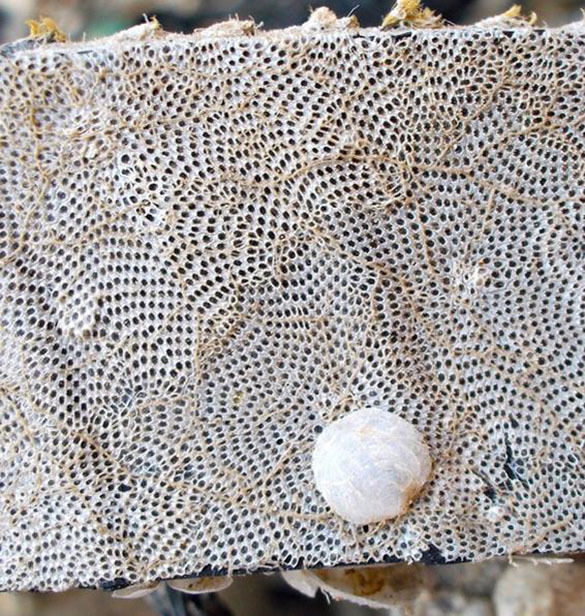 Bryozoans, of course! Here is an Electra pilosa, the most common species. (Photo by Paul Taylor.) We also saw many serpulids, barnacles, oysters and other sclerobionts. A good view of the present to inform our coming interpretations of past hard substrate communities. 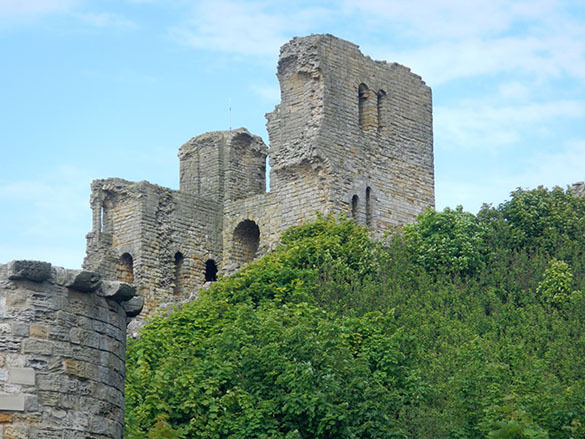 We walked up to Scarborough Castle and will explore it later when we have the chance. There are 3000 years of human history here. In 1914 it was heavily shelled by — you guessed it — the German Navy. In the evening it was back to the busy downtown for a seafood dinner. Our plans are in place, the context is set. Tomorrow we start our fieldwork. Excellent and thorough work, especially by Ron West, has shown that the chaetetids are “hyper-calcified” members of the Class Demospongiae of the Phylum Porifera. They are sponges indeed, but the tubular chaetetid skeleton is found in at least three orders of the demosponges, including living ones. The chaetetid skeleton, which consists of very thin tubes (as shown above) is polyphyletic, meaning several groups of organisms converged on the same form. In this oblique section of a chaetetid you can see the calcitic tubules, somewhat blurred by recrystallization. Here is a cross-section through one of the Bird Spring chaetetids. The tubules are very thin and long, somewhat resembling hair. Chaeto– comes from the Greek chaite for “hair or hairy”. Now we know from systematic studies that the fossil “chaetetids” cannot be classified from their tubular skeletons alone. 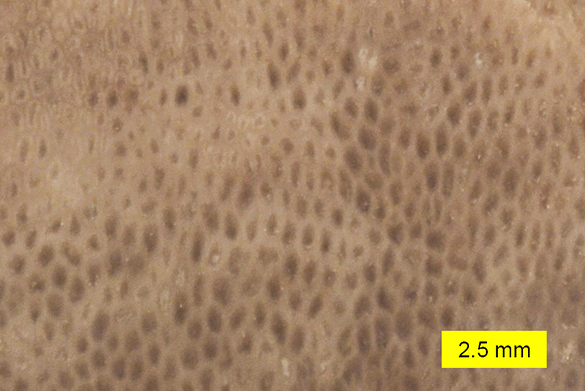 Without evidence of the spicules (which are rarely found, or at least recognized) and original mineralogy of the skeleton (many are recrystallized or, like the one at the top of this entry, replaced with silica) we can only refer to skeletal specimens such as ours as “chaetetid hyper-calcified demosponges”. This is enough, though, for me to reintroduce them into my Invertebrate Paleontology classes. I had removed them from the teaching collections several years ago because of the confusion as to their status. Now they are at least demosponges, hyper-calcified at that. Almazán, E., Buitrón, B., Gómez-Espinosa, C. and Daniel Vachard. 2007. Moscovian chaetetid (boundstone) mounds in Sonora, Mexico. In: Vennin, E., Aretz, M., Boulvain, F. and Munnecke, A., eds., Facies from Palaeozoic reefs and bioaccumulations. Mémoires du Muséum national d’Histoire naturelle 195: 269–271. Martin, L.G., Montañez, I.P. and Bishop, J.W. 2012. A paleotropical carbonate-dominated archive of Carboniferous icehouse dynamics, Bird Spring Fm., southern Great Basin, USA. Palaeogeography, Palaeoclimatology, Palaeoecology 329: 64-82. West, R.R. 1994. 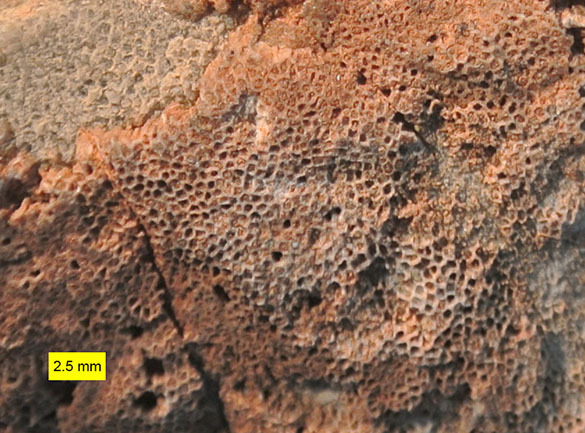 Species in coralline demosponges: Chaetetida. In: Oekentorp-Küster, P., ed., Proceedings of the VI International Symposium on Fossil Cnidaria and Porifera, Munster Cnidarian Symposium, v. 2. Courier Forschungsinstitut Senckenberg 172: 399–409. West, R.R. 2011a. 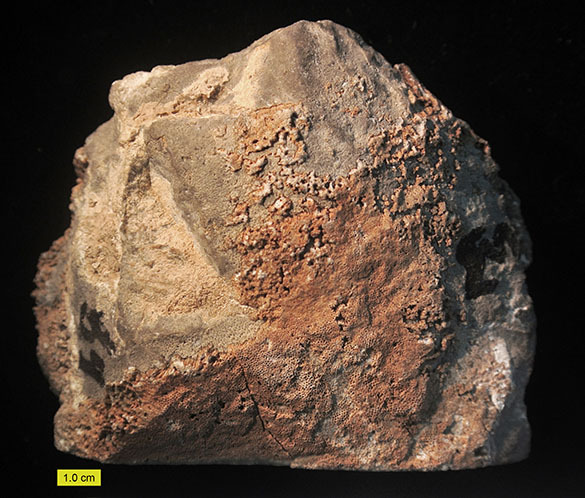 Part E, Revised, Volume 4, Chapter 2A: Introduction to the fossil hypercalcified chaetetid-type Porifera (Demospongiae). Treatise Online 20: 1–79. West, R.R. 2011b. 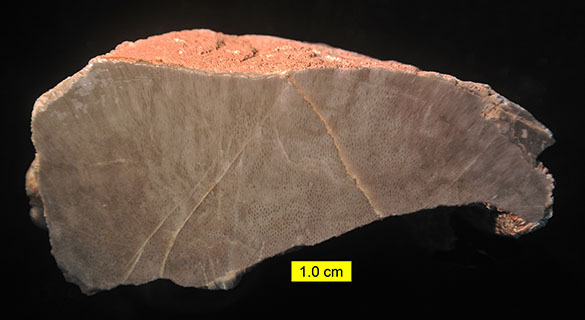 Part E, Revised, Volume 4, Chapter 2C: Classification of the fossil and living hypercalcified chaetetid-type Porifera (Demospongiae). Treatise Online 22: 1–24. West, R.R. 2012c. Part E, Revised, Volume 4, Chapter 2D: Evolution of the hypercalcified chaetetid-type Porifera (Demospongiae). Treatise Online 35: 1–26. Wilson, M.A. 1985. Conodont biostratigraphy and paleoenvironments at the Mississippian-Pennsylvanian boundary (Carboniferous: Namurian) in the Spring Mountains of southern Nevada. Newsletters on Stratigraphy 14: 69-80.